What are we showing you this time? Can you guess what this is? At face value, it is just a collection of rather unprepossessing items: four L-shaped pieces of corroded iron (with nail-holes), a few small bronze items and 20 flat-bottomed glass beads in three colours: transparent/white, green and blue/black. That’s all. 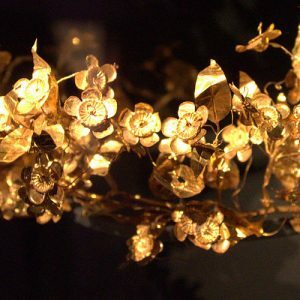 They are on display in the Archaeological Museum of Thessaloniki in Northern Greece. They all come from a single archaeological context: namely from “Tomb B” at the 4th-century BC cemetery of Derveni, some 10km (6mi) northwest of Thessaloniki in the central region of the ancient Kingdom of Macedon. Discovered in 1962, Tomb B is famous for the immense riches it contained. The celebrated Derveni krater, one of the most eye-catching pieces in the Archaeological Museum of Thessaloniki. The cremated remains of a man and a woman were placed within an enormous bronze krater, the vessel used for mixing wine and water at Greek banquets. Simply known as the “Derveni krater” (and certainly deserving of a future post on this blog), the richly decorated object is a very celebrated one: made around 350 BC, it is considered one of the finest surviving examples of ancient Greek metalwork. Its inscription identifies the deceased as the otherwise unknown Astiouneios, son of Anaxagoras, from Larisa. 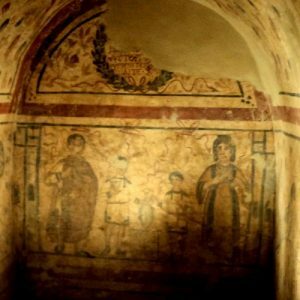 Other finds from the tomb include about a hundred vessels of silver, bronze, alabaster and clay, most of them for the serving or drinking of wine, and various pieces of iron and bronze weaponry. All in all, the tomb assemblage is fit for an aristocrat and warrior of the era: it expresses wealth and taste and it references key roles occupied by upper-class males in ancient Macedon’s society: that of a warrior and that of a participant and host in symposia, the “drinking parties” that were central to social life in such circles. So, what are our relatively humble objects doing amongst such riches? 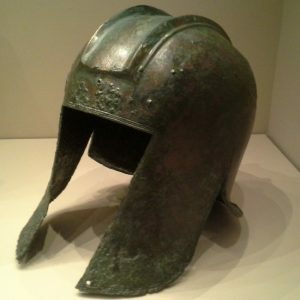 It’s simple: they are what is left of another fine luxury object, representing another activity appropriate for a man of Astiouneios’s standing. They are the remains of a gaming board and the pieces to go with it. The board itself must have been made of a perishable material, most likely wood , so that only the iron corner elements survive, as do the bronze hinges, suggesting that the Derveni Game Board was a folding one. The glass pieces, especially because they come in distinctive colours, are most likely the counters used in whatever game was played on this. Black-figure amphora showing Achilles and Ajax playing a board game. Both heroes are named and the vase is signed by Exekias. C. 540/530 BC, Rome, Vatican Museums. Such finds are not extremely unusual: Macedonian graves across Northern Greece have frequently yielded such gaming pieces, as well as simple six-sided dice similar to the ones in use today. The playing of board games is mentioned in Greek literature from Homer’s Odyssey onwards, and occasionally turns up in imagery, such as a very fine vase by the Athenian potter/painter Exekias, now on display in Rome, that depicts the Homeric heroes Achilles and Ajax (Aias) poring over a game. If the challenge of playing a game befitted such mythical “big men”, a game board was certainly not out of place among the riches buried with Astiouneios! 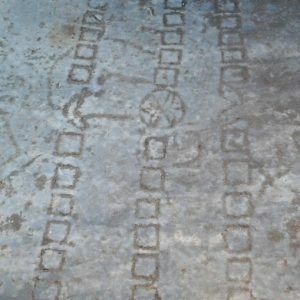 From later eras, we also have a plethora of game boards scratched into stone steps or pavements as usable graffiti – we wrote about one at Didyma on this blog. 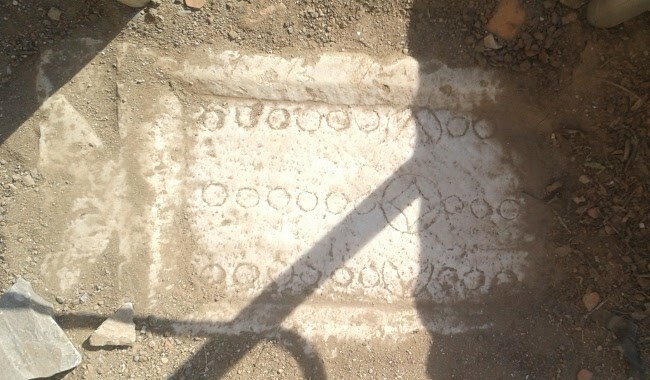 A Roman marble game board next to “Kouretes Street” in Ephesus. It is for tabulae, the Roman predecessor of modern Backgammon. Lacking the board itself, it is impossible to tell what exact game was played on the Derveni Game Board – we can only guess. A number of games appear to have been current at the time, but we can only glean some of their content from literary references. Obvious suggestions includes something similar to today’s Draughts or Backgammon. Once again, by revealing what we know about the object, we’ve opened up some extra questions – that’s how it goes. You can find more such questions – and see the Derveni Game Board and the other remarkable finds from Tomb B – on our Exploring Thessaloniki and Northern Greece tour, alongside many more wonderful things from across the millennia of that region’s fascinating history.